Winterkorn: 500,000 employees by end of 2012 is possible. FRANKFURT -- Volkswagen is looking to increase its global staff by more than 10 percent next year, CEO Martin Winterkorn told a German newspaper. Winterkorn, in an interview published Sunday by newspaper Bild am Sonntag, said it was possible for the group to have 500,000 employees by the end of 2012, up from 449,000 currently. German premium-car makers BMW and Daimler, for their part, struck a more cautious note, saying their headcount next year would depend on the business development, the paper said, citing BMW CEO Norbert Reithofer and his Daimler counterpart Dieter Zetsche. 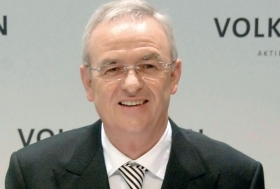 VW has been aggressively expanding globally under Winterkorn's leadership. Winterkorn told Automotive News Europe in September that VW wants to cut costs and boost profits further as part of its mission to rise to the top of the automotive world by 2018 with global vehicle sales of more than 10 million units and a profit margin of more than 8 percent. "We are not just increasing volume but cost effectiveness as well," Winterkorn said. He said that capital investments should not exceed the current 6 percent share of revenue and the share for r&d should not exceed the current figure of 4 percent. "We are completely on track on both figures," Winterkorn said in an interview. A key to reaching the financial goals will be maximizing VW Group's modular car-production system. "You are no longer competitive in the auto industry without such a strategy. Our modular approach reduces costs, production and development time and makes possible an even greater variety of models and technologies," Winterkorn said. "For example, the modular transverse platform reduces one-time and unit costs by 20 percent. The production time per vehicle decreases by about 30 percent, to say nothing of the significant reductions in weight and emissions." Sources: Reuters; Automotive News Europe staff contributed to this report.